The clamor for a Press Law that supposedly would solve the manifest and growing crisis of Cuban journalism, is leaked every so often in the articles of the so-called “comunicólogos”. 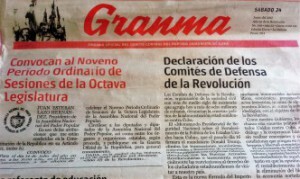 The term was used by Graziella Pogolotti, a member of the Academy of Language in Cuba, in his Sunday column of Juventud Rebelde on March 14th, Cuban Press Day. From then on, there has been a lot of talk about him. On the other hand, Fernando Ravsberg, furiously attacked by leaders and authorities linked to the official media, has also considered the possibility of a Press Law that finally solves the difficulties of the Cuban informers in their necessary relation with the institutions of the State. Meanwhile, the parallel list of reporters expelled from the official media grows when they proclaim “annoying truths” to the prevailing totalitarianism. They are accompanied by colleagues threatened by State Security – those already targeted for collaborating in digital publications – and dozens of independent communicators, who have been detained several times and ill-treated, and often they have confiscated their means and elements of work. Quite simply, any legislation, especially those of special political connotation – which we are dealing with – is subject to the CCP’s guidelines. Their leaders will determine the interpretation and real reach of the entire legislation, which is carefully written by the experts in charge of formulating the Press Law. Finally, the long-awaited law will be voted on by a single-party parliament that will vote by hand and it must be unanimous. If the ruling elite is occupying itself with the task of writing the law, it will probably serve as a “legal” reinforcement to the unofficial gag order that applies to any person who dares to tell the world the truth about what is happening in Cuba. If someone wants more convincing, it is enough to simply remember that the director of a national TV star’s program, Thalía González, expressly forbade her to film the interiors of a foreign exchange store in Havana, when she tried to reveal that the prices advertised on the billboards were false and adulterated by the personnel of the store. The pretext was to, “respect the privacy of the customers”. Pogolotti’s experience shows that the Ideological Department of the Communist Party of Cuba will be responsible for specifying the speed attributable to the process and what should be considered pertinent and to what extent the mandatory compliance will be enforced. What happens to the butterfly that does not land of the flower of the pumpkin? Is the butterfly stupid, or what…! What happens?